VTexplorer is an Internet Explorer browser extension that simplifies the process of scanning Internet resources with VirusTotal. It allows you to scan links (including links to files) directly with VirusTotal's web application. It will scan the submitted URLs with URL analysis tools and the content downloaded from the scanned site with VirusTotal's antvirus solutions. Unlike VTzilla, VTexplorer does not embed itself in the browser's download dialog, only in the context menu. You can still scan any file that you want to download by right-clicking on the link to the file and choosing the Send URL to VirusTotal option. Enough! I am sick and tired of reading, just let me install the extension, I will figure out alone how it works. This document is intended for any user that wants to learn how to use VirusTotal's browser extension for Internet Explorer, VTexplorer. No technical background is required in order to understand the document. Thus, this document is intended for Internet Explorer users. The main purpose of VTexplorer is to help the community in securing their systems. Having said this, if we can also collect interesting data to analyse and study, even better. We are interested in malware, obviously, so if you come across any malicious file download link do not hesitate to scan it with VTexplorer. Additionally, thanks to VirusTotal's URL scan service we hope that users will be willing to send us phishing and any other fraud/ecrime related sites. Why? Because hopefully these sites will end up being processed by the URL analysis tools integrated in VirusTotal and will improve their efficiency, and thus end-user protection. Please note that you will need to install the extension under each user account with which you wish to enjoy the VirusTotal functionality. Imagine you have logged into your gmail account and you have received a suspicious email from your bank. The email is informing you about an unauthorized access to your account and is asking you to follow a link and provide your credentials to view the account access log. 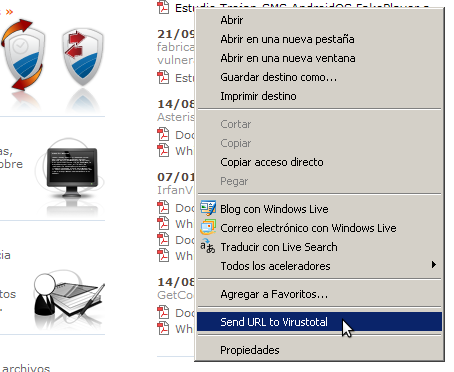 This will open a new Internet Explorer window, such window will show the report for the requested URL scan. Note that the scanning process will also download the file/site of the target link, so do not forget to click on the View downloaded file analysis link. VTexplorer adds its own icon to Internet Explorer's topbar, clicking on its icon you will scan the web site being displayed in the active browser window with VirusTotal. As before, a new window will be opened with VirusTotal's report.